Its official Kim Kardashian got engagement to her baby’s daddy and long time boyfriend Kayne West. Kayne proposed in an extravagant way! He rented our At&t Giants Stadium and hired a band to play all of Kims favorite songs. On the scoreboard he proposed “Will You Marry Meeeee!”. 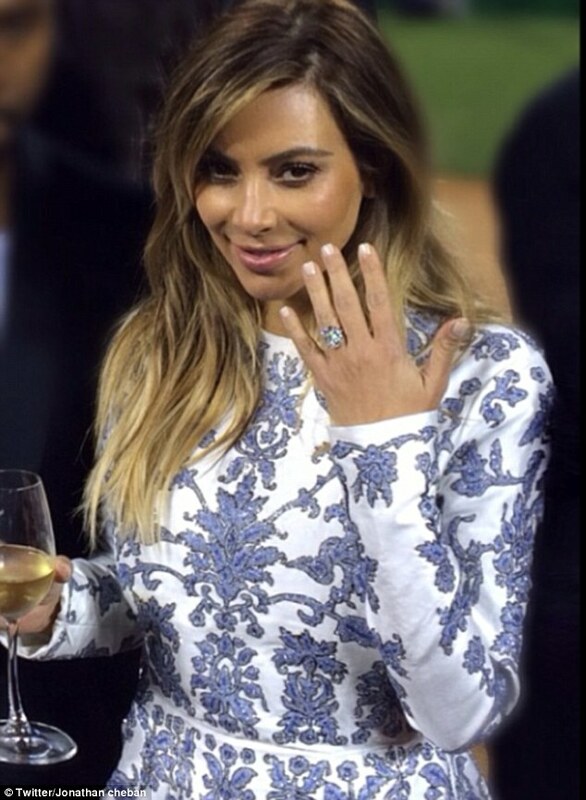 Kayne West proposed with an over top 15 carat sparkler. The diamond appears to be cushion cushion cut and prong set on a slim solitaire setting. The diamond is D color Flawless and valued at four to five million dollars. Good work Kim! This entry was posted in Celebrity Diamond Engagement Rings and tagged celebrity engagement ring, engagement ring, kim kardashian on October 23, 2013 by blog1039. LIBERTYVILLE September 24, 2013 — Pompeii 3 Jewelry has been selected for the 2013 Best of Libertyville Award in the Jeweler category by the Libertyville Award Program. Each year, the Libertyville Award Program identifies companies that we believe have achieved exceptional marketing success in their local community and business category. These are local companies that enhance the positive image of small business through service to their customers and our community. These exceptional companies help make the Libertyville area a great place to live, work and play. Various sources of information were gathered and analyzed to choose the winners in each category. The 2013 Libertyville Award Program focuses on quality, not quantity. Winners are determined based on the information gathered both internally by the Libertyville Award Program and data provided by third parties. The Libertyville Award Program is an annual awards program honoring the achievements and accomplishments of local businesses throughout the Libertyville area. Recognition is given to those companies that have shown the ability to use their best practices and implemented programs to generate competitive advantages and long-term value. The Libertyville Award Program was established to recognize the best of local businesses in our community. Our organization works exclusively with local business owners, trade groups, professional associations and other business advertising and marketing groups. Our mission is to recognize the small business community’s contributions to the U.S. economy. This entry was posted in Uncategorized on October 1, 2013 by blog1039. How should a ring fit? What are the most important questions to ask when buying an engagement ring? What the most important thing when looking for a wedding ring. "This high quality womens ring features a cushion cut ceylon 3.02CT genuine sapphire. The ring is fla http://t.co/f7DCu2LqUm"
"Pompeii3 Acknowledgement for Outstanding Performance on http://t.co/U72hPobabq. http://t.co/aABnbGss8n"
"Pearl is June's birthstone checkout out our new collection.... http://t.co/avJJGJgRFW"
"Gatsby Style Earrings only $249.99 + FREE Shipping! http://t.co/ebVG10ApxE"
".40CT Princess Cut Diamond Ring 14K Yellow Gold - $479.99 http://t.co/jyWiKKnJHJ"